He might drive her crazy, yet spending time with Tanay sparks a passion Mita never knew she had. It’s only meant to be temporary, but when Tanay looks at her with that smouldering fire in his ebony eyes, Mita can’t help but surrender to the temptation of her fake boyfriend…! Starting with exotic locale in Mauritius, ‘Scorched by His Fire’ journeys towards our Delhi via Dubai and ends at Kolkatta. And what a scorching journey! Our cute, beautiful heroine Mita is misunderstood by Tanay, and here comes the interesting part which is unusual to classic Mills & Boons, he is a detective! (adding to hottie quotient). There is something about law officials, which makes me drool over them. Women in Mita’s family are all beautiful, which makes her oblivious of her charm. The misunderstanding creates more conflicts and an emotional trauma for both of them as they get genuinely attached to each other and finally fall in love. What I loved about the story was that it was fast paced with balanced emotional scenes. The scene with the lehenga-choli in the mirror is mind blowing. Chemistry between Mita and Tanay really scorched, burned and crashed me. The twist in the end which gives us a profound message is well thought of. All in all a highly recommended read! Reet Singh is a doctor and has published before – in medical journals – so even before she wrote her first work of fiction, she had experience of writing for an unseen audience. Her first book was written for children. ‘The Zaken Takeover’, for middle-graders, has been co-authored with her son, and is available on Amazon, for Kindle. back. 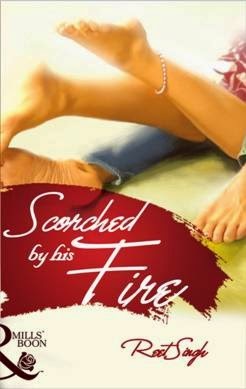 ‘Scorched by His Fire’ was released in February 2014, and the Kindle edition released later, in June. Book two from Mills and Boon® India is at the editing stage and should be available sometime later this year. Next Post Hollywood Recalibrated… what do you think fellow Indians?